In our community we want everyone to feel like a family, which is one of the reasons why we have countless amazing associates on our Rockland Place team. Some of our team members stand out a little bit more due to their passion and personalities. Tyetta L. is one of our stellar Licensed Nurse Practitioners in our community. She has been with Rockland Place for over a year and has made quite the positive impact. Her care and compassion to the residents is unparalleled, her knowledge in the field is quite remarkable, her bond with her team is impressive and the connection with families is genuine. 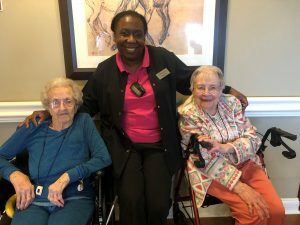 Every single day Tyetta has a smile on her face and displays a professional attitude with residents, family members, fellow associates and guests. She says that her favorite thing about working at Rockland is above all else the residents! We sure are lucky to have her on our Rockland Place team. Thank you for all you do Tyetta – keep it up!